Pillowy potato gnocchi are the perfect canvas for a variety of sauces. During the summer, nothing can replace a fresh tomato sauce. However, in spring we like to serve our gnocchi with homemade pesto. 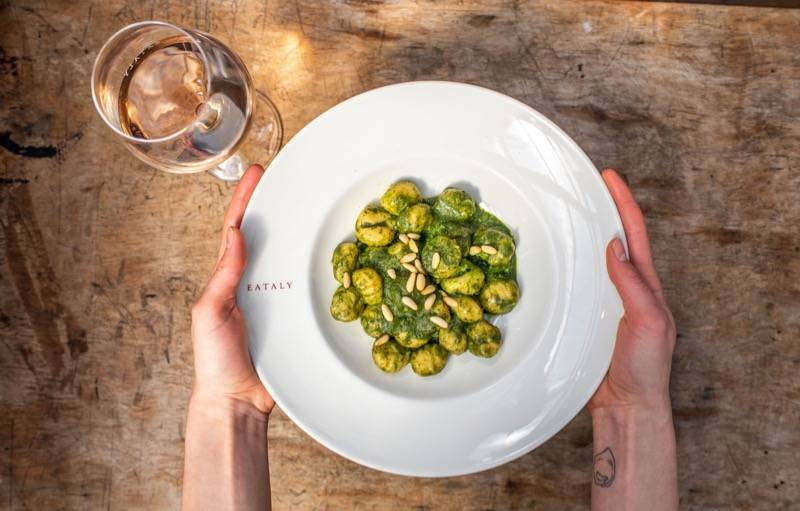 In this recipe, our chefs gently blanch fresh basil leaves and raw spinach, then puree them together to create a vibrant green sauce that tastes like springtime in Italy. Bring a large pot of water to a boil. Add salt. Prepare an ice bath for the basil and spinach. Fill a container (such as a large pot or bowl) with some ice water and place a colander on top. Blanch the spinach and basil in the boiling water. As soon as the leaves become bright green, use a slotted spoon to strain them out and add them to the colander on top of the ice water bath. This will shock the greens and stop the cooking process. In a food processor, blend the spinach, basil, 1/8 cup extra virgin olive oil, and a pinch of salt. If the pesto seems too thick, add a touch of the ice water to maintain the beautiful green color until it is the right consistency (think: a slightly melted milkshake). The pesto can be made a day ahead of time and will keep in the fridge for two to three days (any longer than that and it may start to discolor). Bring a large pot of water to a boil. Add salt. Drop in the gnocchi and follow the cooking time instructions on the package. In a separate pot (big enough to fit the pasta and be able to stir it around easily), add three tablespoons of the basil-spinach pesto with a bit of extra virgin olive oil and some pasta water. Once the gnocchi are cooked, toss into the pot with the pesto and stir to combine, making sure to coat all the gnocchi in the sauce. Add grated Parmigiano Reggiano and a drizzle of extra virgin olive oil. If the sauce gets too thick add a touch of the pasta water to thin it out. You're looking for the pesto to coat to the gnocchi, but not be too clumpy. Plate in your favorite bowl and garnish with the toasted pine nuts. Add more Parmigiano Reggiano if desired.